Hale » Roger Perron Inc.
Wende and I would like to take this opportunity to let you know how we perceive the recent addition completed on our home. When we bought our house seven years ago, we were told by the inspector, “You have 800 square feet of livable space in your attic.” Those words have echoed ever since, but we never thought possible what you have accomplished. As you know, one of our greatest considerations was to increase the existing space, while not diminishing the essence of our 70-year-old house. You and your fine tradesmen have succeeded in such a way that our expansion is virtually indistinguishable from the original; no “add-on boxes” here! 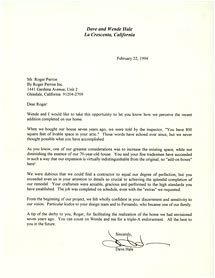 We were dubious that we would find a contractor to equal our degree of perfection, but you exceeded even us in your attention to details so crucial to achieving the splendid completion of our remodel. Your craftsmen were amiable, gracious and performed to the high standards you have established. The job was completed on schedule, even with the “extras” we requested. From the beginning of our project, we felt wholly confident in your discernment and sensitivity to our vision. Particular kudos to your design team and to Fernando, who became one of our family. A tip of the derby to you, Roger, for facilitating the realization of the home we had envisioned seven years ago. You can count on Wende and me for a triple-A endorsement. All the best to you in the future.